Apple's services outage stretched into its ninth hour today, with several crucial components of Apple's online empire, including the iTunes, the iOS and OS X app stores, and the iBooks market remaining offline as of 11:30 a.m. PT. "We apologize to our customers experiencing problems with iTunes and other services this morning," Apple said in a statement first provided to CNBC and confirmed to Computerworld. "The cause was an internal DNS error at Apple. We're working to make all of the services available to customers as soon as possible, and we thank everyone for their patience." Reports of problems surfaced earlier today and affected other services, including iCloud. "I am trying to update one of my apps but when I get asked to sign into the Mac App Store I get a "Status_Code_Error" appear in red letters to the bottom of the login window," reported someone identified only as xXDivineSparkXx in the first message of a long thread on Apple's support forum, posted before 3 a.m. PT today. Several hundred others chimed in -- from locations across the U.S., Europe, the Middle East and Asia -- to report the same. Computerworld staffers have been unable to log into iTunes or the App Store since 6:15 a.m. PT, with the "Status_Code_Error" as well as others such as "The iTunes Store is temporarily unavailable. Please try again later." Earlier today, Apple's services status page said all was well, with green lights across the board. After an update, however, the page now shows iTunes, iBooks, and the iOS and OS X app stores as "Unavailable for all users." 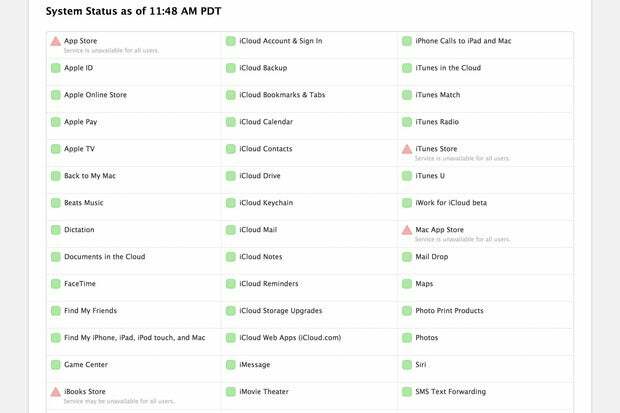 On the system status board, Apple also acknowledged that iCloud account log-in was affected until just before 6 a.m. PT, as was iCloud mail, the Cupertino, Calif. company's online email service. Apple's online services have generated an increasing amount of revenue, ranging from fees for additional iCloud storage space to payments for apps, music and other digital content. In Q4 2014, for example, service revenue was $4.8 billion, up 9% from $4.4 billion in the same period the year before. By comparison, the Mac line of personal computers produced $6.9 billion in revenue during the fourth quarter of 2014.